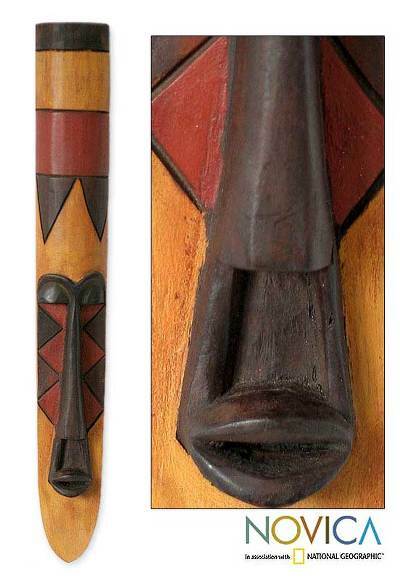 Gabon Africa mask, "Fang Celebration"
Subtle diagonals of red, gold and black illuminate a long, slender visage. Nii Noi 'Chico' Norte carves its perfect symmetry from African sese wood. Representative of Gabon's Fang people, such masks are worn during happy celebrations. Nortey is a master restorer of collected antiques, as well as an imaginative creator of new carvings. Nii Noi "Chico" Nortey was born July 28, 1950 and when he was five years old, he was promptly sent off for schooling. By age 21 he'd completed the first five years of secondary education with a School Certificate. However, due largely to financial constraints, Nortey could not extend his academic endeavors. Having considered multiple offers from his parents to work with the government department of his choice, Nortey decided to reject the life of a "pre-cut" salaried worker. Rather, he launched into carvings of antiquity, as this was his true inclination and notable success with the trade has proven him right. An African-American friend of his who shared common artistic interests, spurred Nortey on his way to self-establishment in carvings. After Nortey had helped him on a personal venture, his friend loaned his "original" African brother with a commendable sum of money to support his business in Ghana. In the course of time and with good fortune, Nortey has been able to build up galleries of collections of carvings. These collections are purely African, concentrating on the region of West Africa from Senegal, eastward to Mali and the Cameroon, and then the central portions of Africa - the Congo in particular. These areas are heavily influenced by the spiritual power of objects, especially fetish items. So far, Nortey has collected carvings, but among his future interests are fetish objects from antiquity. The artisan observes that he's neither fetish-minded nor fetish-influenced. Rather, he deals with fetish objects purely for their intrinsic artistic endowments, and their valuable historical content. Qualitatively, Nortey prefers works created in ossese wood to all others. He states that this particular kind of wood resists insect pests which would attack it were it not a species of wood rather bitter to the taste. A number of exhibitions in which Nortey has participated testify to his reputation as an upstanding professional in his field. He has been present at almost all exhibitions on art organized by the American community in Ghana. He has been honored with invitations outside Ghana, some of which, though, he has had to decline due mainly to constraints of serious engagements in his home country. As a busy entrepreneur, he has trained many people to help him with his business. Nortey is a master restorer of collected antiques, as well as an imaginative creator of new carvings.